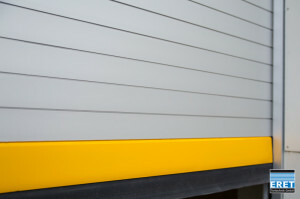 ERET High Speed doors type ASE and PSE have an option of a safety yellow bottom bar without extra costs. Its a standard feature on non powder coated high speed doors. According the experiences, aluminum high speed doors have much less damages due to a crash than flexible high speed doors. Probablay because it looks more valuable for users. The safety yellow bottom bar makes this effect even stronger and gives a visible indication of the actual door position.